Below are some common questions about our course, the FAA Part 107 Test and other rules & regulations. The questions have been grouped into categories for simplicity. Q. How do I become an FAA licensed Part 107 drone pilot? A. In the U.S, new regulations have been in place since August, 2016. Titled Part 107, these new rules provide an avenue for drone certification by passing the in-person FAA Part 107 Test at an FAA-approved testing center. This is a streamlined, updated process that is meant to reduce red-tape and other barriers of entry into this industry. For more information, read the complete text of the regulation. Q. What if I already have a manned aircraft pilot license? A. If you hold a pilot certificate issued under 14 CFR part 61 and have completed a flight review within the previous two years, our course is not for you. You simply need to complete a (free) online training course, available on the FAA website. Q. Do I have to pass a medical exam to get my Part 107 Drone License? A. No, you do not. There is no medical exam requirement under the Part 107 regulations. It's up to the pilot, or operator to determine whether they are both physically and mentally capable of flying. Q. How long does your Online Drone Training Course take? A. We want to ensure you are as prepared as possible for the FAA Part 107 Test. The Online Drone Training Course can take anywhere from 6-12 hours but this is done on your time, at your pace. You can log out anytime and pick up from where you left off next time. Q. How much does the Online Drone Training Course cost? A. There is a one-time low payment of $49.00 for the Online Drone Safety Course. The fee includes our entire Online Drone Training Course as well as the quizzes and a final practice exam for 30 days. If you need access to the course after 30 days, you can subscribe for another 30 days for the low cost of $25.00. Q. Can I take the Online Drone Training Course and practice exam at any time? Day or Night? A. Yes. There are no restrictions as to when you can take the Online Drone Training Course or complete the quizzes and practice exam. Our website is online 24 hours a day, 7 days a week, every day of the year and is fully accessible from your computer, tablet or mobile device. Q. How many chapters are in the Online Drone Training Course? A. 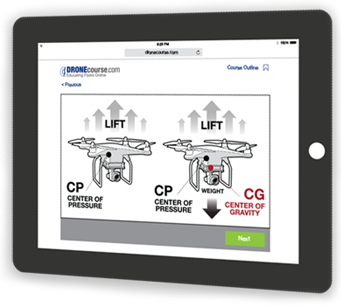 The Online Drone Training Course has 6 chapters followed by a review section. Depending on how fast you make your way through the material, the entire course should take between 6 and 12 hours of your time. Q. What topics are covered in your Online Drone Training Course? A. Our fully illustrated and narrated online drone training course is broken down into 6 chapters which includes an introduction to the process, an overview of current commercial regulations, understanding airspace, exploring weather, operating your drone and decision making/emergency operations. Q. How many questions are there in the chapter quizzes and what is the percentage required to pass? A. All end-of-chapter quizzes have 5 multiple choice visual questions. In order to move on to the next chapter of the online drone safety course, you are required to get 80% or higher. Q. How many questions are on the final practice exam and what is the percentage required to pass? A. The final practice exam online has 60 multiple choice visual questions. In order to pass, you are required to get 80% or higher. Q. Who can take the FAA Part 107 Test? A. If you are interested in becoming a commercial sUAS (drone) pilot, you must be over the age of 16 and proficient in English. You must also be in a physical and mental condition to safely operate a drone. Q. How much does the FAA Part 107 Test cost? A. The cost of the FAA Part 107 Test is $150. This is the in-person test taken at one of the 700+ approved knowledge testing centers across the country. This money is paid directly to these centers when you're scheduling your exam. Q. How often will I have to take the FAA Part 107 Test? A. You’ll need to pass a recurring Part 107 Test every two years in order to maintain your certification. This recurring exam doesn’t require the same amount of proficiency as the first exam however you will have access to our course and study material for life once you sign up – so we’ve got you covered there. Q. I’m ready for the FAA Part 107 Test? How do I book one? A. You can view a list of all testing centers and their contact information from across the country here. When you’re ready for your test, simply contact the testing center of your choice to book a suitable time.